I woke up this morning at a time most would consider brutally early, especially as I’d been at a house party last night. Since I am not blessed with the powerful ability to sleep through anything for hours and hours like some people can (directing this jealously at my gf) I decided to fill up the time by just making myself write whatever came into my head and not stopping till I’d finished this damn blog post. And here I am! Halfway through already. And I haven’t even started talking about the recipe! See that’s why it was so frustrating that I couldn’t make myself write this week, because this recipe I made up was so spectacular and deserves more of a showcase than me having to threaten myself with throwing my laptop into a ravine if I don’t write about it soon. So, the recipe: I recently became wise to the fact that you can make risotto but with pasta instead of rice. Curious cat that I am, I wanted to try this, and happened to have some risoni in my pantry (by which I mean my designated food drawer in the flat kitchen) but didn’t really have much else. Luckily restriction can make the most delicious things happen, and I ended up improvising based on the few ingredients I had by gently frying the uncooked risoni in garlicky butter that I then stirred miso paste into. From then all I added was water and it ended up the most lush, creamy, intensely flavoured thing ever. Seriously. Just stupid old water. 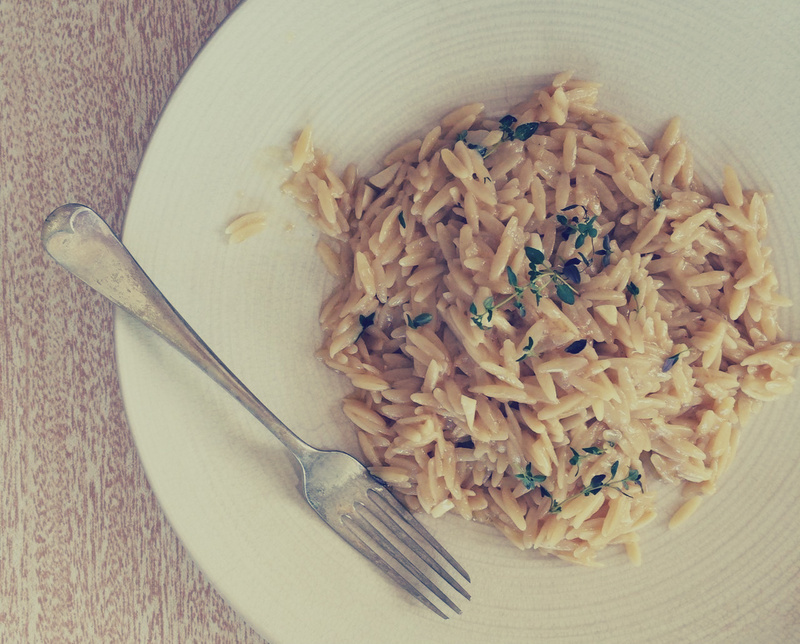 Risotto is totally the white noise of food, because it’s almost hypnotically calming to make. You just keep adding water and stirring until it’s pleasingly absorbed into the grains, and then add more and stir again, just moving your wooden spoon around and around the pan repeatedly like you’re actually a gif instead of an IRL person. 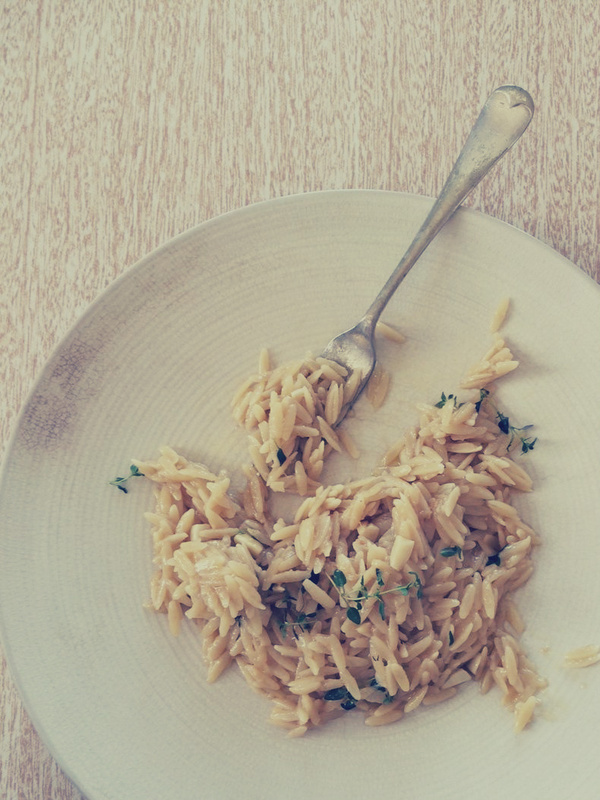 Like, if ever there was a recipe that encourages you to zone out and be mellow, it’s risotto. a recipe by myself. serves one. Melt the butter in a wide saucepan. Finely but roughly chop the garlic and throw it into the pan, stirring over a medium heat until the garlic is a little golden and it smells amazing. Stir in the miso paste – it won’t amalgamate completely but this will all sort itself out soon. Tip in the uncooked pasta, and stir it for a minute or so to cover it in the garlicky butter. Add water half a cup at a time, continuing to stir the pasta until most of the water is absorbed before you add any more. Continue in this way until the pasta has absorbed enough water to become tender. Tip onto a plate, strew over some herbs if you like. Thyme is one of my favourite herbs and I happened to have a plant that I hadn’t yet managed to kill so I used some leaves from that, and it worked perfectly. 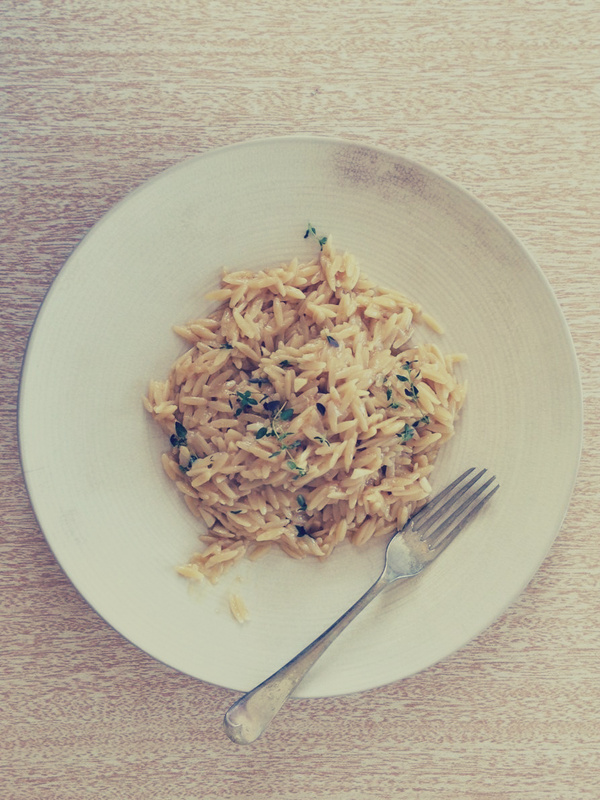 I love pasta, I love risotto, so putting them together is like trapping myself in a pincer movement of happiness. So if that sounds like your idea of A Good Time, perhaps consider this recipe next time you need to feed yourself. I know I will. Thanks for bearing with me through all that, it’s like…the more time that passes since I last wrote a blog post the more panicky I get, because this blog is the most important thing to me and I don’t want it to have the slightest hint of abandonment or even just falling off the wagon, you know? All of which results in me putting more pressure on myself to write whenever I have the time to, which isn’t that often, which is probably why my brain rebelled on me by being all “nope”. PS last night’s party was themed “Between the Devil and The Deep Blue Sea” and it was a joint birthday party for my dear friends Kate and Tim. 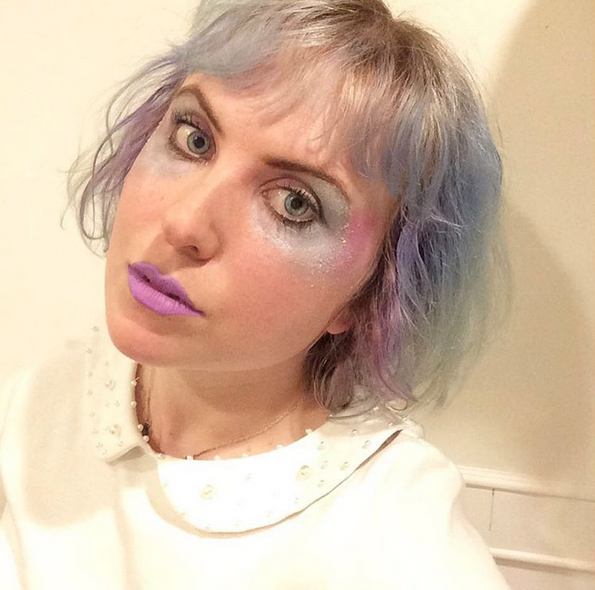 I dressed up as a pearl and covered my face in makeup. I wish it was chill to wear this kind of eye makeup all the time, it’s so fun. PS PS as a final attempt to convey how delicious and wonderful the risotto is, here is me licking the plate after eating it. 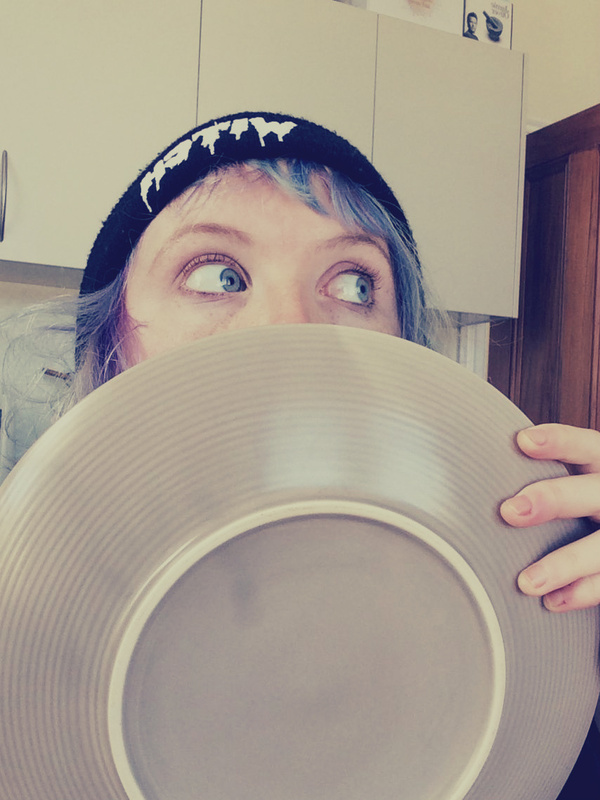 As well as outlandish makeup, I wish it was more chill to lick the plate in social settings. The tongue is nature’s spatula! I can’t quite bring myself to finish this blog post with that line, but…at least I managed to bring myself to finish this blog post at all. title from: Fall Out Boy, Don’t You Know Who I Think I Am? Party like it’s 2006. Ummm, more Fall Out Boy, I’ve Got All This Ringing In My Ears And None On My Fingers is such a tune. Haim, Don’t Save Me. We danced to this last night, I love it so much, I could listen to it endlessly. next time: Well, I refuse to have as much trouble as I had with this one. I refuse!